An enormous land management planning effort is underway in the American West, involving ten states and 60 million acres of what remains of sagebrush habitats on public lands. The Bureau of Land Management (BLM) and the U.S. Forest Service (USFS) are writing these plans with the stated purpose of avoiding the Endangered Species Act (ESA) listing of the greater sage-grouse (Centrocercus urosphasianus). The draft Resource Management Plan Amendments (DRMPA) released so far have failed to fully address the “present and threatened destruction, modification, or curtailment of the habitat or range of the greater sage-grouse,” and to implement the mandatory and enforceable regulatory mechanisms necessary for the recovery of the species or meet the requirements of the ESA. All of the plans rely on a flawed habitat model, and none of the plans meaningfully or immediately address the known threats that domestic livestock pose to sage-grouse and sagebrush habitats on public lands. An overarching problem is that all the draft plan amendments begin with already scaled back models of habitat, and then differentiate between “primary” habitat and “general” habitat (and in some plans other habitat classes still), affording them differing levels of protection. None of the plans consider protecting large land areas, restoring sagebrush habitats, or seek to recover the species throughout its former range. The baseline is greatly reduced from the bird’s original range and the proposed protections only address an already whittled down range for the species. One issue with all of the draft plans is that the livestock management prescriptions are inconsistent across the range of sage-grouse. This makes no sense, since the needs of sage-grouse are the same or very similar throughout the West. The varying degrees of protection the plans afford are obviously political rather than scientific. Some of the provisions are better than others. Below, we highlight the laudable parts of the plans that bear repeating range-wide, as well as make suggestions for how to improve the language in all of them. Sage-grouse scientists recommend that livestock not be turned out into sage-grouse habitat until after June 20th and that all livestock be removed by August 1st in order to allow for herbaceous regrowth and provide cover to benefit sage-grouse the following spring.³ To protect winter sage- grouse habitat, winter grazing should be restricted to the period from November 15th to March 1st. 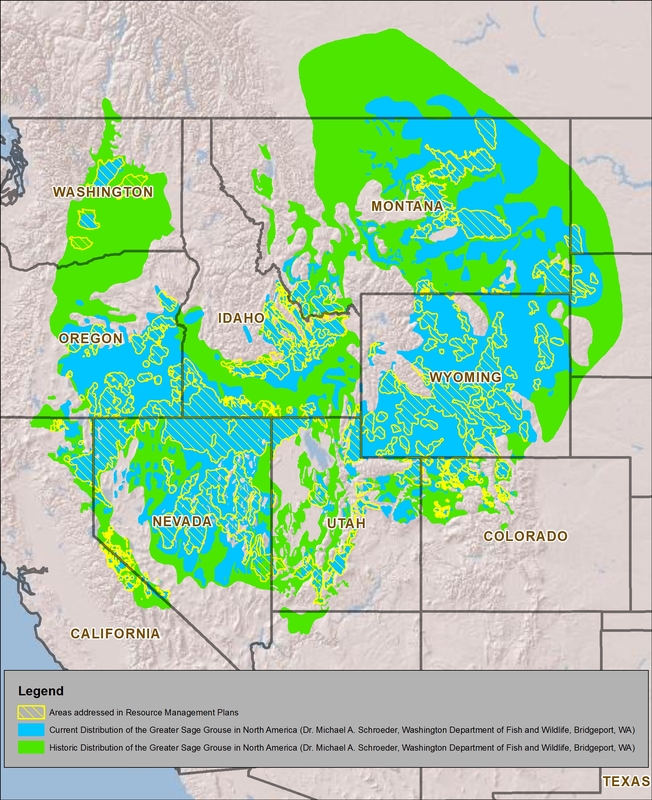 The draft plan that most closely adheres to the seasonal closure recommendation is the Idaho and SW Montana DRMPA, which states, “Modify authorized seasons of use to provide greater flexibility in managing livestock for the benefit of GRSG.”4 While this doesn’t incorporate the specific dates described in the scientific literature, it is an improvement over the language in most of the other plans that recommends, generally and without a specified time frame, “Consider singly or in combination changes in season of timing of use, numbers of livestock, distribution of livestock use, intensity of use, and type of livestock.” (e.g. Lewistown DRMPA, North Dakota DRMPA.) The verb “Modify” is stronger than “Consider” but in neither case does the plan restrict spring or fall grazing outright. Sage-grouse experts recommend limiting the use of herbaceous vegetation by livestock to 25- 30 percent of annual production.5 This limit is critical for nest success, a key component of conserving and recovering sage-grouse. Despite this, none of the DRMPAs include language limiting herbaceous cover utilization to 25-30 percent of annual production. Sage-grouse experts recommended a minimum 7-inch residual stubble height standard, a level at which vegetation would afford the best chance of nest success.6 None of the draft plans include stubble height requirements, despite the support this recommendation has elsewhere in the scientific literature. Though many of the draft plans include reference to use of the BMPs, this comes largely in the context of energy development water infrastructure. Many carry forward the NTT recommendations to consider mosquito breeding in context of future and proposed water projects. None provide any requirements or restrictions on existing water infrastructure. 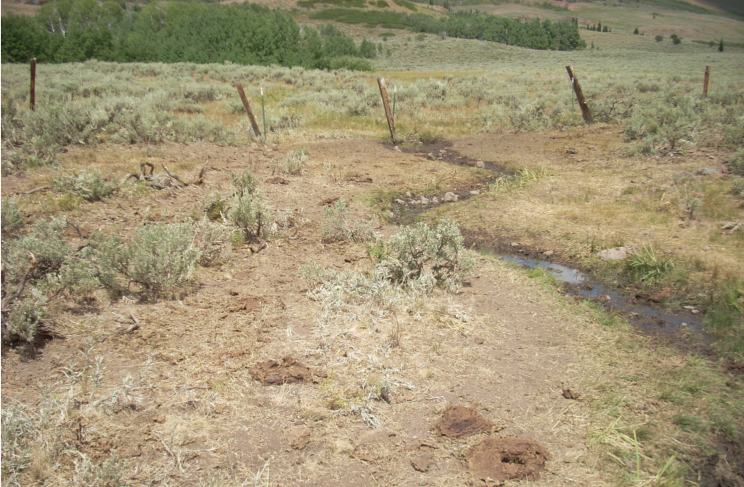 Sage-grouse collisions with fencing are a major cause of mortality, and one of the reasons that livestock grazing infrastructure is incompatible with the species. The “Conservation Objectives Team” (“COT”) report recommends that structures with negative impacts to sage-grouse or their habitats should be removed or modified to remove the threat. The Billings – Pompey’s Pillar proposed amendment states, “Existing range improvements would be evaluated and modified to address impacts on wildlife populations (e.g. sage-grouse/fence conflicts).”8 North Dakota’s plan states, “To reduce outright GRSG strikes and mortality, remove, modify, or mark fences in high risk areas within PH based on lek, lek size, and topography.”9 Notably, none of the plans specify a time frame for this modification, and none specify how the agencies will decide whether to modify or remove an adversely located fence. The Wyoming Game and Fish Department reported that fence marking reduced grouse mortality by only 60 percent.10 The most conclusive study on the issue of whether or not fence marking was successful in preventing sage-grouse collisions showed that the efficacy varied according to distance from lek and the local abundance of sage-grouse, and that collision can only be fully eliminated through fence removal.11 Given the dire straits of some lek populations, every effort should be made to reduce fence-strike mortality. Recommended language for all plans: No new fences will be approved within five miles of active leks. Existing range improvements will be evaluated within one year of plan approval, and removal of all fences within two miles of leks will be implemented within one year thereafter. Marking or removal will be considered for fences outside of this two-mile buffer based on lek, lek size, and topography. Even if each of the plans adopts the highest possible standards for livestock management in sage-grouse habitat, they will all have to overcome the deferred management implicit in all the draft plans. In each and every case across the West, the sage-grouse plan amendments do not impose immediate relief for sage-grouse via mitigation or management measures, but instead “kick the can down the road” to make decisions at the site-specific level when grazing permits are renewed. For the majority of allotments (56 percent of all of those in sage-grouse habitat), recent renewals mean that current permits won’t expire until 2019-2024, and even so, because of ongoing legislative efforts, permit renewals do not necessarily entail a timely environmental review. For example, the Lewistown (Montana) draft plan says both, “”Habitat objectives would be considered when evaluating an allotment’s conformance with land health standards prior to renewing a grazing authorization,” and, “Adjust grazing permits during the renewal process to include measures… to achieve desired habitat characteristics.”12 This means that any protection the plans do afford to sage-grouse and sagebrush habitats won’t become immediately effective, but would “be considered” and maybe adopted later. It is important to note that this type of language ensures that changes won’t occur until permits are renewed and fully processed under NEPA, something the agencies are woefully behind on throughout much of the West. The agencies have used legislative riders on annual appropriations bills to renew grazing permits without environmental review. For BLM allotments in sage-grouse habitat, fully 55 percent of all grazing permits have been renewed using the rider since 2004, and in some states and field offices, the percentage swells to over 70 percent. See map below. If this trend continues, even the protection promised for future consideration will be put off indefinitely for most sage-grouse habitat. Recommended language for all plans: Habitat objectives in the RMP would be implemented immediately through automatic grazing permit amendments and compliance checks would occur beginning the year following plan approval. The time is now to save the sage-grouse and the sagebrush sea from the devastating impacts of livestock grazing. For over a century, this high and dry desert has been impacted by herds of cattle and sheep, infested with non-native vegetation spread by grazing animals, burned in intense wildfires caused by these new plants, and had important soil crusts trampled and destroyed. Sage-grouse trends show the dire situation the species faces in the American West. Our public lands – the lands these plans will prescribe management for during the coming decades – need more than the federal agencies have given so far. Sage-grouse need a reprieve from yearlong, unchecked livestock grazing practices, and they need it now. Western Watersheds Project is a non-profit conservation organization with a mission to protect and restore western watersheds and wildlife. WWP has offices in Idaho, Arizona, California, Montana, Oregon, and Wyoming. 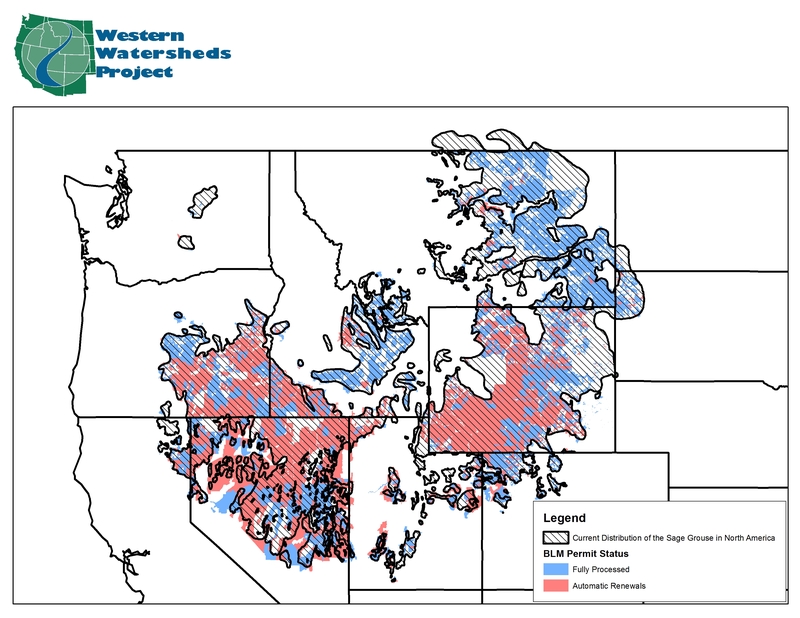 Please visit wwp.westernwatersheds.org for more information. 2 BLM 2013. South Dakota DRMPA at 123. 3 Braun, C.E. 2006. A Blueprint for sage-grouse conservation and recovery. Grouse Inc. Tucson, Arizona. 5 Hagan, C.A., J.W. Connelly, M.A. Schroeder. 2007. 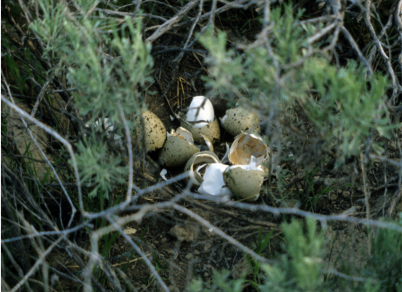 A meta-analysis of greater sage-grouse Centrocercus urophasianusi nesting and brood-rearing habitats. Wildlife Biology 13:Suppl.1 42-50. 6 Connelly, J.W., M.A. Schroeder, A.R. Sands, and C.E. Braun. 2000. Guidelines to manage sage-grouse populations and their habitats. Wildlife Society Bulletin 28(4): 967-985. 9 BLM 2013. North Dakota DRMPA at 2-82. 10 Christiansen, T. 2009. Fence marking to reduce Greater sage-grouse collisions and mortality near Farson, WY – Summary of interim results. Wyoming Game and Fish Department. 11 Stevens, B.S., K.P. Reese, J.W. Connelly, and D. Musil. 2012. Greater sage-grouse and fences: Does marking reduce collisions? Wildlife Society Bulletin 36(2):297-303. I think the recommended language changes are great as far as the sage-grouse are concerned. However, what disturbs me is just how much most environmental groups are avoiding the bigger picture with cattle and just how destructive they are on any host of issues- whether it be habitat destruction, water-sources, pollution, waste (before and after slaughter), predator ‘management’, tax payer funded subsidies and the list goes on. I don’t see any value in cattle on public lands whatsoever other than maintaining an outdated lifestyle for a low number of individuals. 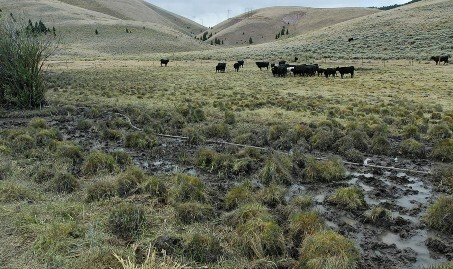 Livestock grazing on public land is welfare for the ranchers. I’m a retired rancher and I never needed that welfare. I’ll bet that most of the ranchers that use it don’t like handouts for other people. I’ll bet you are right, Sheryl! Here’s to women ranchers! I keep thinking that rather than help the agencies come up with resource management plans that might look good enough to avoid listing that conservationists should do all we can to be sure an ESA listing happens. Then and only then are there tools powerful enough to do more than “consider” change. Yes, but you can also ask them to do the right thing outside of court. If you don’t put them on notice you don’t really have standing to bring them to court when they do the wrong thing. I, as a representative of Western Watersheds Project, can assure you that we support listing of sage grouse simply because the agencies have a dismal record on this issue. I think the USFWS is going to have a very difficult time arguing that sage grouse are not endangered and they have no rational argument to say that they are precluded from protection this time. have you considered that the Wild Horses may be a companion to protect Sage Grouse? The Welfare Cattle Ranchers are targeting the horses and the BLM is removing them at a frantic pace to appease the ranchers in Utah and Nevada, spurred by a Bundy-esque State’s Rights assault. Although the horses are protected under the Wild Free-Roaming Horse and Burro Act of 1971 and are to be “primarily” managed, cattle are routinely given priority and are allocated nearly 80% of existing forage. The horses territory has been greatly reduced, occupying a small percentage of Herd Management Area compared to that occupied by privately-owned cattle. 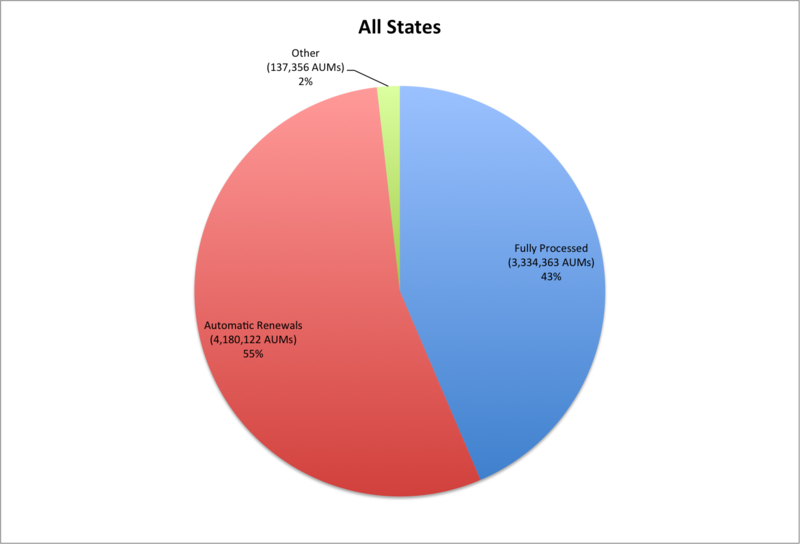 BLM’s latest figures claim 49,000 Wild Horses on Public land HMA’s. Wild Horse Observers such as Cloud Foundation and Wild Horse Education (WHE) claim as few as 20,000. This compared to millions of Cattle. The smaller numbers and differences in horse behavior and diet would let the range resort to a more natural state. If cattle grazing were restricted or eliminated,wild horses and grouse could be allotted the same range, fencing removed. Horses would maintain a level of fire protection, are much more observant of where they step and do not foul riparian areas, as cattle. grouse would be free of cattle. I have mixed feelings about wild horses. I don’t agree that they are “native” and I certainly don’t think they are compatible with arid landscapes, no large ungulates are. While I do think they are unfairly villainized by ranchers and the BLM, they are not innocuous. I often find that horse advocates have little regard for habitat quality for other species and many argue that horses don’t need to be managed at all. They just want more horses. I disagree. There is no basis for that assertion. For that to be true then they would have to graze it down to nothing and then there would be no sage grouse habitat left. I’ve seen some very significant damage caused by horses to riparian areas as well. Thanks for responding Ken Cole…. There is,indeed, much scientific info supporting horses, as Native. Here is a recent article. True, they are not innocuous, as presently managed. They are forced onto smaller and smaller parcels, most of which are shared with an inordinate number of cattle and sheep, making it impossible to tell which species, caused what. The number of horses is very small when compared with the numbers of cattle and sheep. Horses have one stomach and pass seeds intact along with a dry, nutrient-rich “package” of fertilizer. Unlike, cattle, whose 4 stomachs and rumination destroy the viability of seeds. As for the fire protection, given enough room to roam, horses do not graze down to nothing, as cows, who have no upper teeth and pull the grass out by the root. You and I both know the political opposition regarding the removal of cattle. The Wild horses, in their small numbers, could be an asset. The cattlemen want them gone. The cattlemen, insist that cows are necessary in fire prevention. Recently, BLM announced the removal of 200 horses in Southern Utah, after County Commissioner David Miller, united with Cliven Bundy. BLM was deluged with 35,000 signatures and letters in opposition. Horse Advocates and the many powerful Groups such as Cloud Foundation, Wild Horse Education, Protect Mustangs and American Wild Horse Protection could become valuable Allies with the Sage Grouse Advocates. Our common foe is the Cattlemen. Think about it. How do you explain that no living Native American ever saw a horse , let alone used them , till the Spanish showed up with them in the Southwest , or before the colonization of eastern North America by the Euros ? Before the Euros, no horses. Natives packed dogs instead. The A’Palouse horse ( we call them Appaloosa) was in fact native to North America, a very very long time ago before human migration . Appaloosas migrated back over the Bering land bridge leaving no sizeable number ( any ? ) behind. The appies went extinct here. There certainly were no significant numbers of them in North America at the end of the last glaciation when the Clovis and Folsom people appeared. The Appaloosa was reintroduced to North America along with all other breed of horses in more modern times. CC- probably mentioned in a past post, that I have a tooth from a prehistoric, ice age horse. (A professor, at the University in Bozeman, confirmed it was authentic, he actually was excited about my tooth 🙂 Found it in an old, dried stream bed, that had recently flooded, in Texas. “While science may still be a long way from definitively concluding what truly exterminated the Ice Age animals, humanity’s track record over the last few centuries does not exactly paint an optimistic picture for our future. For further insight, watch the video on the website I posted above. I found one in Missouri,Nancy! There are no living Native Americans that were alive over 600 years ago and still alive today. Humans rarely live to be over 100 years old. Well, I think it is very likely that horses brought from Europe may have reached the Lakota people before Europeans did because the first reintroduced horses probably reproduced and expanded on their own in the interim. That doesn’t support the notion that they are “native”. Ken, who do you believe “reintroduced” the horses (if they were reintroduced, which is up for debate as we now have DNA supporting a horse living from 7,600 to 10,500 years ago in North America)? We also have DNA evidence which shows that modern horse evolved in North America. The Spaniards brought them up through Mexico. Did you take a look at this Ken? If the County Commissioners win this on behalf of the Cattlemen, they will be unstoppable. Ken Cole I would strongly urge you and other environmentalists to reconsider the necessity of those with a common interest in preventing the extinction of species to join forces against a common enemy: profiteers who will otherwise continue to drive both the Sage Grouse and out wild horses into extinction. It is speculative at this point whether wild horses being as few in number as they are would have any more than a minimum impact on the environment compared to overgrazing livestock. The issue of whether they are “natural” or not is esoteric compared to whether they might not be a bullwark and political ally in the effort to save certain areas from the invasion of livestock or fracking for that matter. Considering the power of the profiteers who seem determined to hasten the extinction of a wide variety of species, it is a case of united we stand divided we fall. I would have to take issue with the claim that cheat grass would have to be grazed down to nothing to constitute a significant fire brake compared to the continuing risk of overgrazing by livestock. Of course environmentalists and wild horse advocates can stand on the purity of their demands with no compromise and cooperation. But then you may be certain we will both lose. Western Watersheds Project has worked with horse groups on some litigation and I do agree, to some extent, that we have a common interest. I am only speaking for myself in this regard. There are staff who support the interests of wild horses. How can we work together Ken? I know Protect Sage Grouse Petitions have been circulating on Horse Advocate FB pages for a while now. We all sign and share. Will there be a Decision concerning the Grouse by Fiscal Year 2015? 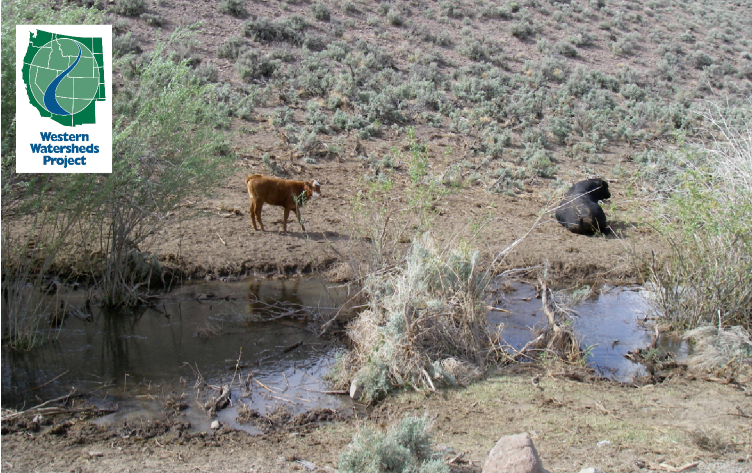 Provide comments, protests, and appeals on grazing permit renewals. yes, more and more of us are doing that. do you think there is any chance of making a difference in Protesting via formal letters against Gas/Mining Leases? I know Wild Earth Guardians was recently successful in opposing a mine Expansion in Colorado. The Court ruled that bLM did not take a “hard look” and approved expansion based on financial gain alone. What about buying-out Grazing Permits? There are only a few places where grazing permit buyouts can occur. Yes, let’s work together, Ken. Thank you. If the Cattlemen get the upper hand on the Wild Horses, they become unstoppable. Can you have a Lawyer look this over? We can raise donations. I have a Pledge of $1,000.00 to start. Is my friend David Nevin, still with you? There are ancient pictographs by Native American people depicting horses and even riders. Read the above article that I attached, which indicates fossils have been found suggesting a continual habitation by horses. It is disputed that horses vanished entirely from North America or the Americas during glaciation. Even if they were here, migrated and then migrated back, they are none-the-less, Native. Are the wild horses currently living in the American west descended from the native stock or from feral european stock, that is the question. I don’t doubt that horses persisted in North America and that the Indians had domesticated them, but were they all killed as the article you posted leads me to believe? sorry not your article, I was referring to the article posted by Morgansinke. Does anyone know how wildfire plays a role in greater sage grouse habitat? It seems natural that wildfire would be a overall benefit as greater sage grouse live in habitats where frequent wildfires occur. If wildfires were allowed to burn and sagebrush steppe habitat was allowed to regenerate naturally without human intervention (ie. no cheat grass seeding), sage grouse and its habitat would be adversely affected on the short term but wouldn’t there be long term benefits with younger, healthier sagebrush?